Aqueous ozone, sometimes called liquid ozone or O3, is a powerful and natural oxidizer which disinfects 50 times better and 3000 times faster than bleach. With the long term health effects of bleach now becoming known, liquid ozone is gaining in popularity once again, as a toxic-free alternative for disinfecting surfaces. For these reasons, it has been used in food processing and city water treatment plants throughout the world. As most of us know, ozone naturally occurs in the atmosphere. Ozone is created naturally when sunlight adds an extra oxygen atom to O2 molecules in the air. Some of this ozone is then infused into rain drops, resulting in aqueous ozone. ​Science has been able to produce liquid ozone for over a century and a half, since being able to control electrical current. Scientists have known about its cleaning and disinfecting properties since the late 1800’s. At the turn of the 20th century liquid ozone was being used in municipal water treatment plants to purify city water supplies. ​​The USDA has certified liquid ozone as GRAS (Generally Recognized as Safe)” meaning it can be used in agriculture and industrial food processing plants. It is further used in some hospitals to disinfect patient and surgical rooms with “fogging machines” that mist spaces with a fog of aqueous O3. ​​At the Allergy, Asthma, and Sinus Institute we have a sink with a dedicated ozone unit. 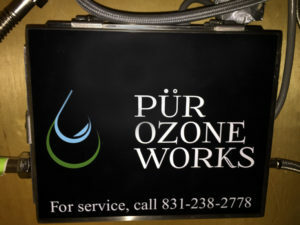 We use the ozone water to clean our instruments and work surfaces, in addition to standard sterilization techniques.